I finished my story and chose not to publish it here since it will be printed in Janet’s book. Storify is an incredible tool. 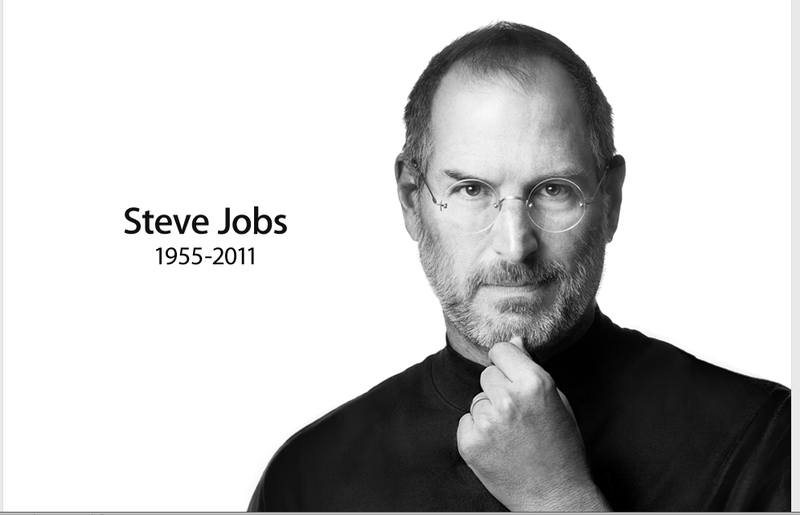 It is absolutely amazing what I managed to find using Storify. I found tweets from citizen journalists, activists and others on the ground in Cairo during the protest. All of these people were using Twitter to spread and receive information. They were tweeting directions to protests, pictures of what was happening on the ground, maps and pointing to others in different locations on the ground. I watched them strategize and assemble in real time. With Storify I was able to filter through all the noise and find them all. I’ll say it again, amazing. I’m experimenting with Storify for the first time, and I have to admit it’s a bit more confusing than I thought it would be. If you don’t know what Storify is, it’s an online curation tool, or website, that allows you to organize information from Twitter, Facebook, Youtube, Flickr and the what not as stories or glimpses in time. You can see an example of it in my post titled, Verify, Verify!!! My assignment is to create a “Storify” story for Janet’s book. A little background: my professor, Janet Kolodzy, is writing a new textbook on social media and convergence. It’s supposed to be a “how to” manuel of sorts. I’ve been helping her when I can. 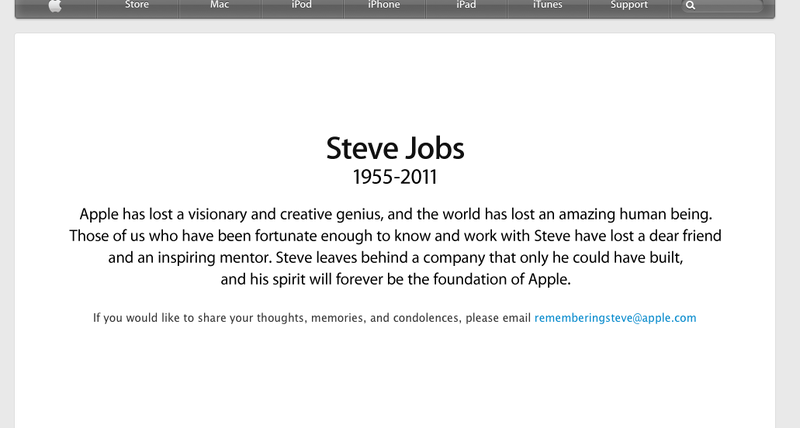 Here’s a very good example of what Storify can do: http://bit.ly/swXnhe. For my assignment, I’ve chosen the Syrian protest in Cairo as the topic for my story. My plan is to find tweets that demonstrate how the protest played. In essence, I want a beginning, a middle and an end. I’m coming across so many tweets, retweets and pictures. But the one question that sits at the front of my mind is: how can I trust any of this? Sure, I can use the tweets from Al Jazeera or CNN, but wouldn’t it be cool to find the original tweets from people who were on the ground when the protest occurred? Is that even possible? And if so, how do I verify their credibility from my tiny room in Brookline? I know Storify is supposed to help me organize everything, but I kind of feel like I’m searching for a needle in a haystack (cliche, I know). So to try to navigate my way through twitter-verse and facebook-verse and whatever-verse that exists within this Storify-sphere, I’m reading everything about Storify that I can find. I’ll let you know how it turns out. 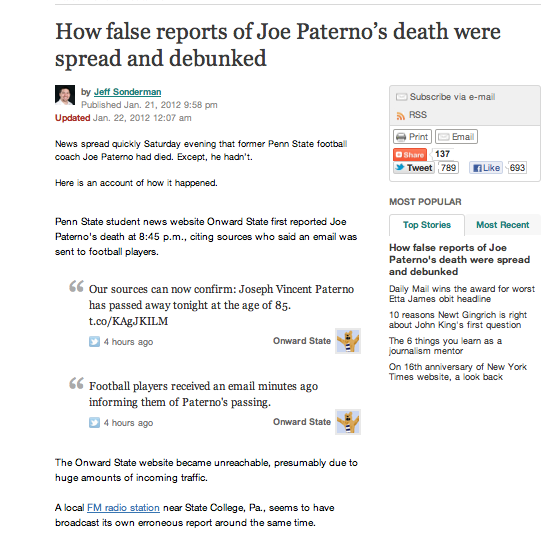 Poynter used Storify to show how false reports of former Penn State football coach Joe Paterno’s death spread and were debunked. This is a great use of an important social media tool. It’s also a great way to teach a valuable lesson. Let’s this be a reminder to all journalists and bloggers. Getting it first isn’t always getting it right. How false reports of Joe Paterno’s death were spread and debunked | Poynter..
New England regulators are taking months — and sometimes years — to sanction factories the U.S. Environmental Protection Agency calls HPVs or high priority violators of the Clean Air Act. These are facilities that repeatedly exceed air emission limits or violate state and federal environmental orders. New England has nine of these facilities which are recorded on a closely guarded U.S. Environmental Protection watch list. And late last year, the list was made public for the first time following a joint Freedom of Information Act request from the Center for Public Integrity and NPR. The following story is a result of that FOIA result. I wanted to share a documentary my classmates, Shuyi Wang and Tamara Starr, and I made for our documentary filmmaking class at Emerson College. It’s called “In the Moment” and runs a little over 12 minutes long. It is about a young fashion design student named Marie. She is our protagonist and spends most of her days sewing at the School of Fashion Design on Newbury Street. Her story of self-discovery will surprise and delight you. The cinematography and editing must be credited to Shuyi, a young independent filmmaker who is more amazing than she realizes. Tamara also was a great asset. She is enthusiastic and has many fresh ideas. Anyway, check out the doc below. I used to be in the newspaper business. Now, I’m in the news business. My method of disseminating the news is no longer confined to one medium. I can write. I can shoot. I can edit. I can produce long form. I can write short for the Web or for broadcast. Am I the best at it all? Honestly, no. I can do some things better than others. But I know that if I had to do it all alone I could manage. I can produce a product that is ready for the masses. It took two and a half years to get this far, and it’s been the hardest period of my entire life. I’ve cried. I’ve spazzed out and laughed uncontrollably and jumped with glee. I’ve pushed and been pushed to my limit. And along the way, I’ve met a lot of interesting people, did a lot of cool things and learned more lessons than I could ever imagine. Now, I’m here, sitting at my kitchen table allowing the deem pilot light from the stove to cast me in a glow. My only thought right now is, what’s next? Where do I go from here? What can I add to journalism? How can I do something new?